I am currently disgruntled. 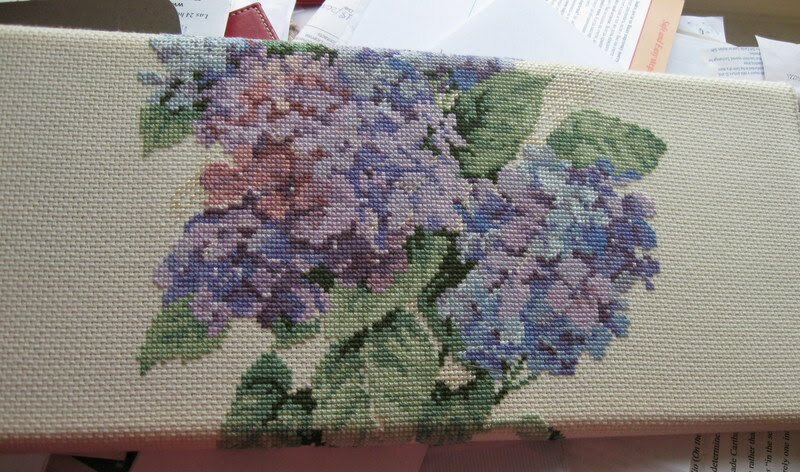 Long-time readers may remember a series of posts from last year in which I noted that I used to do a lot of cross-stitch, was possessed of the desire to pick it up again, and rediscovered that cross-stitch can be kind of boring. I put aside the project in the fall, secure in the knowledge that, although it was not nearly complete, I didn't have a deadline. After all, the friend who was engaged hadn't even set a date yet. It has advanced considerably, true, but it is still not done. So for the foreseeable future, all my knitting time is devoted to cross-stitch. Argh! My travel projects are still knitting, of course--cross-stitch doesn't travel well, owing to the need for complicated charts and lots of thread. But I haven't been putting in the work I usually do, and I'm really feeling it. At this point, I'd abandon the cross-stitch and knit something for the happy couple if it weren't for a few factors. 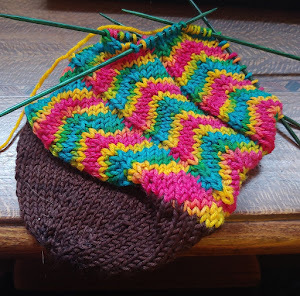 Aside from being half-done with the damn thing, I don't know the woman getting married well at all (I'm quite good friends with her fiance), and I hesitate to knit something for someone I don't know well. Cross-stitch seems safer. But I miss knitting, she whines. It's a little further advanced than when I took this picture, but not by a whole lot. What did I learn from this year's Olympics? My limiting factor isn't skill but time. 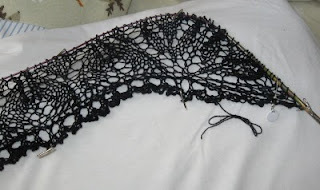 Nothing in this shawl so far has thrown me--not even the provisional cast-on. Of course, probably a lot of that is Anne's crystal-clear instructions, but still. I'm no slouch! So next year, the trick is going to be finding something I'll have time to complete in two weeks. Lots of hats, maybe? Speaking of Anne, I had the opportunity to meet her weekend before last at Eleganza Yarns' Indie Artist Celebration. In addition to Anne's trunk show (which is amaaaazing), the shindig included the work of all sorts of local spinners, dyers, and fiber types. And I may or may not have purchased a few things. Then there's this beauty, courtesy of Blue Ridge Yarns--100% silk laceweight in "Dragon's Breath." This picture doesn't do it near justice, nor do the pictures on their website. (Which is probably a good thing for all of your credit cards.) I confess, I had to call the Irishman for a fiber intervention at this table--I had about four skeins in my hands before I got talked down. If I ever win the lottery, I'm totally cleaning them out. And the best part of the day, of course, was meeting Anne! Not only is she as funny and gracious in real life as she is on her blog, she knew who I was. *squee* I have such a huge designer crush on Anne, and it was so much fun to meet her and see all her knits in person. So that was two weekends ago, and I'm still recovering. (As is my credit card, *ahem*.) Now time to go get some more done on the Irishman's socks. Oh yes, you remember the big blue things from last time? They're NOT BIG ENOUGH. So I need to finish unpicking the bind-offs and knit a few more inches onto the cuffs. Curses!